Eclectic shabby chic colours mixed with exposed natural wood grain gives this coffee table a vintage charm. A robust structure with a simple profile and one open shelf providing space to house books, magazines and living accessories. Ideal for use anywhere throughout your home, particularly in the living room or bedroom. Earth-friendly reclaimed wood from our Rustic Beach collection. Each piece has a unique character with its grain and marks. Additionally, it comes with a natural time-worn, vintage look and shabby chic colour-pop details. Only man-made is handmade construction and hand sanding detailing makes sure the wood is smooth to the touch, giving the old wood a good new lease of life. Timeless, versatile and naturally beautiful. 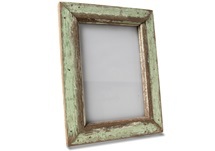 Suitable for all kinds of contemporary décor from a rustic style farmhouse to a beach themed home. Assembly not required. Featuring a glass table top and one shelf for displaying your books, magazines and small living accessories.